The person who started the fight must be the one to end it. The person who was wrong must be the one to end it. If the person who started the fight and the person who was wrong are not the same person, the fight can never be ended. Though we all naturally attempt to repair our interactions with our partners when the conversation careens off the tracks and into negative territory, our attempts to de-escalate these conversations often fail without us knowing why. Dr. Gottman’s scientific studies involving thousands of couples have revealed the usefulness of several constructive steps to making and receiving repair attempts! Try to find a way to resolve disagreements by asking your partner about their concerns by finding common ground, stating that their point of view makes sense. It also helps to share when you feel persuaded or that you feel that you both are moving towards a solution. Remember to take a break if you really need to calm down or feel flooded with emotion, feel that your conversation has become entirely derailed, or feel that your partner’s emotional state (or your own!) is impeding the ability of the two of you to have a constructive conversation. 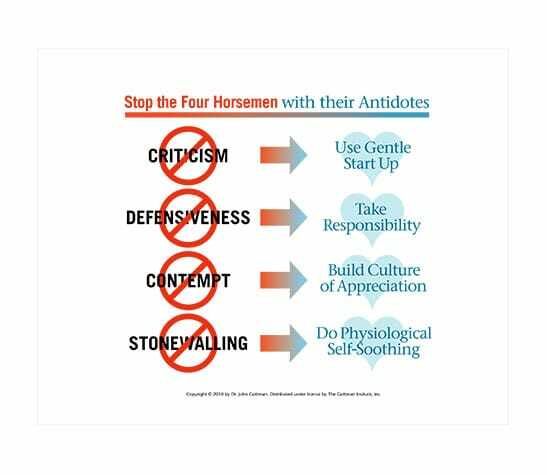 To “Stop Action,” as Dr. Gottman calls this in his Weekend Workshop for Couples, you can simply ask to stop, ask for a break, ask to change the subject, or observe that you are getting off track. Make sure that you both agree on a time when you will return to the discussion after you have both calmed down. We hope that you can use Dr. Gottman’s third skill of Managing Conflict in your own disagreements with your partner in two ways: to exercise better judgment in interpreting your partner’s statements (and their possible implications) before your disagreement escalates, and to limit the damage that such disagreements can create in your relationship by directing your conversations into positive territory. Practice these skills along with those from our blog entries last week, and look forward to Friday’s Weekend Homework Assignment, in which we will share an exercise to help you practice repair attempts. Have a great week! According to our research, fondness and admiration are two of the most crucial elements in a rewarding and long-lasting romance. 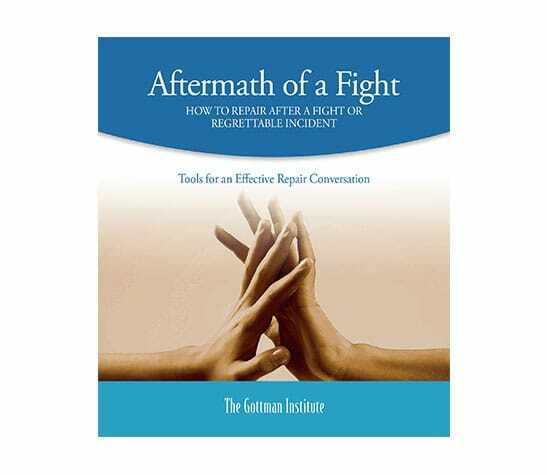 Before we continue on with The Sound Relationship House Series and move to Make Life Dreams Come True, the level above Manage Conflict, we want to spend some time this week discussing what to do in the aftermath of a fight or regrettable incident.